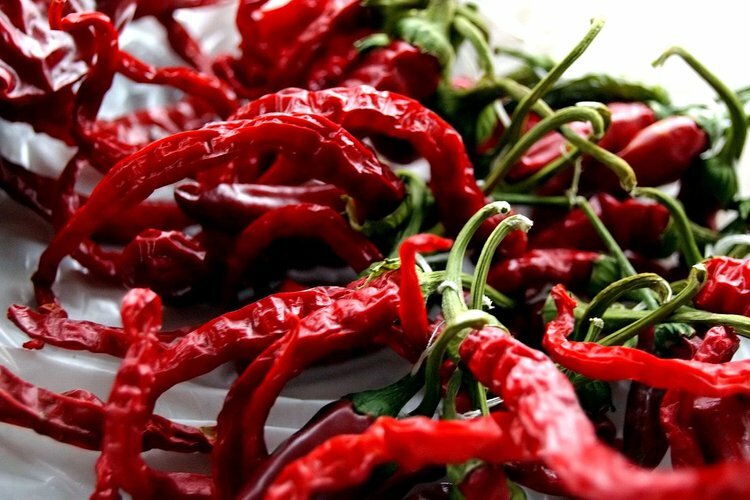 What Are The Healthiest Spicy Foods? Spices help in weight management, are used as digestive aids, and contain anti-inflammatory and antioxidant properties that are invaluable to one’s health. Spices have been used for thousands of years around the world to add extra flavor to food. However, spicy foods do more than merely add flavor to one’s favorite dish. Heat-packing spices, like chili peppers, jalapenos, habaneros, and cayenne, offer an astounding variety of health benefits. Spices help in weight management, are used as digestive aids, and contain anti-inflammatory and antioxidant properties that are invaluable to one’s health. What is the Active Ingredient in Spicy Foods? Capsaicin, the active ingredient found in jalapenos, cayenne pepper, and red chili peppers, may lower bad cholesterol, thus improving heart function. A study presented at the American Chemical Society reports that capsaicin helps reduce the accumulation of cholesterol in the body by increasing the breakdown rate. The researchers also found that capsaicin blocks a gene that narrows the arteries and increases blood flow in the vessels. Grilling and barbecuing at temperatures above 375 degrees leads to the formation of toxins called heterocyclic amines (HCAs) that are linked with colorectal, stomach, lung, breast, prostate and other types of cancers. Adding spices can reduce the formation of these toxins by up to 40-42%. Spicy foods can help individuals manage their weight and even lead to weight loss. A study conducted at Purdue University suggests that red pepper consumption can lead to eating fewer calories. When the researchers monitored their participants, they found that the participants ate approximately 75 fewer calories, compared to eating bland food. A Canadian study found that a group of men who had appetizers with hot sauce consumed 200 fewer calories than their peers who did not use hot sauce. The researchers also found the chemicals in peppers, called capsaicinoids, can reduce cravings for fatty, salty, and sweet foods in individuals who regularly eat spicy foods. Capsaicinoids can increase the core temperature and help burn more calories faster than usual by increasing the body’s brown fat cells. If an individual does eat too much fatty food, spicy food can reduce the damage of a high-fat meal. When eating a fatty meal, triglycerides and insulin spike, which stores unused sugar as fat. Individuals who incorporated spices into their meals had a 31% decrease in triglyceride response and 21% decrease in insulin response. This is because spices, like turmeric and cloves, are high in antioxidants that improve insulin sensitivity. What Are Some Really Healthy Spices? Cinnamon: It contains iron, calcium, and manganese, and is loaded with antioxidants and health benefits. Cardamom: It helps counter acidity and makes fatty foods more digestible. Chili peppers: This spice can help alleviate pain, improve heart health, stop ulcers, and even help fight prostate cancer. Turmeric: It can reduce inflammation in arthritis patients and may block the formation of some cancers. There are a variety of spices to choose from. Adding more spices to one’s meal for flavor can amplify health benefits, instead of adding more salt. Spicy foods can help manage weight and even help in losing weight. Also, spicy foods can manage blood sugar levels and even help you control insulin levels. Huang, W., Cheang, W. S., Wang, X., Lei, L., Liu, Y., Ma, K. Y., ... & Chen, Z. Y. (2014). Capsaicinoids but Not Their Analogue Capsinoids Lower Plasma Cholesterol and Possess Beneficial Vascular Activity. Journal of agricultural and food chemistry, 62(33), 8415-8420. Ludy, M. J., & Mattes, R. D. (2011). The effects of hedonically acceptable red pepper doses on thermogenesis and appetite. Physiology & behavior, 102(3), 251-258. Ng, T. P., Chiam, P. C., Lee, T., Chua, H. C., Lim, L., & Kua, E. H. (2006). Curry consumption and cognitive function in the elderly. American journal of epidemiology, 164(9), 898-906. Puangsombat, K., Jirapakkul, W., & Smith, J. S. (2011). Inhibitory activity of Asian spices on heterocyclic amines formation in cooked beef patties. Journal of food science, 76(8), T174-T180. Yoneshiro, T., Aita, S., Kawai, Y., Iwanaga, T., & Saito, M. (2012). Nonpungent capsaicin analogs (capsinoids) increase energy expenditure through the activation of brown adipose tissue in humans. The American journal of clinical nutrition, 95(4), 845-850. Byrnes, N. K., & Hayes, J. E. (2013). Personality factors predict spicy food liking and intake. Food quality and preference, 28(1), 213-221. Ludy, M. J., & Mattes, R. D. (2012). Comparison of sensory, physiological, personality, and cultural attributes in regular spicy food users and non-users.Appetite, 58(1), 19-27. Duffy, V. B., Hayes, J. E., Sullivan, B. S., & Faghri, P. (2009). Surveying food and beverage liking. Annals of the New York Academy of Sciences,1170(1), 558-568. Temml, C., Wehrberger, C., Riedl, C., Ponholzer, A., Marszalek, M., & Madersbacher, S. (2007). Prevalence and correlates for interstitial cystitis symptoms in women participating in a health screening project. European urology, 51(3), 803-809. Srinivasan, K. (2005). Role of spices beyond food flavoring: Nutraceuticals with multiple health effects. Food Reviews International, 21(2), 167-188. Smith, J. R., Lanier, V. B., Braziel, R. M., Falkenhagen, K. M., White, C., & Rosenbaum, J. T. (2007). Expression of vascular endothelial growth factor and its receptors in rosacea. British journal of ophthalmology, 91(2), 226-229.